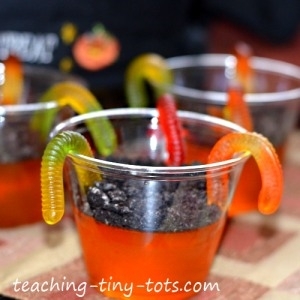 Gummy Worm Treats in Jello! We saw this at Mom.me and had to try it!! The girls had a lot of fun making it and even more eating it! We bought orange and purple (Grape) flavored Jello for Halloween. 1 bag of gummy worms, we found the solid color and clear but decided the clear looked best. Add boiling water to gelatin mix, stir 2 minutes until completely dissolved. We put cups onto two small cookie sheets to carry easier. Carefully pour into plastic cups about half way full. Let cool so the candy doesn't melt. Balance three worms over the edges. The ones that were already curved in half worked well. Crush oreos in a ziplock. When jello has firmed, place about 2-3 tablespoons in the center of the cup. Spread the oreos with a small spoon to cover the entire surface of the jello. Crush 1/4 - 1/2 bag of oreos first. Depending on how thick you want your layer, you will need only about 2-3 cookies per cup.